Lock in a great price for YOTELAIR London Gatwick Airport - rated 8.7 by recent guests. Brilliant for a night stay or a few hours, good quality, comfortable bed and excellent shower. I would have like some aircon as I felt a little stuffy during the night but overall it was amazing! It was functional and served my needs as expected. These are pod rooms and as long as you're happy with that arrangement then there's little to complain about. Complimentary hot drinks! Staff super friendly and helpful. The room is small but has everything you need. I used this Hotel as an alternative to arriving at a hotel in central London late on and it was a great alternative, I am a very light sleeper and was concerned it may be noisy with Planes and airport but was NOT the case, I had a great sleep and started my day off with breakfast in the airport before heading into City. Will use again!!! Shower was good and TV good also. Everything you need for an overnight stay for early morning flight? The bed was comfortable and the room was surprisingly quiet. The shower was hot and the water pressure good. The staff were polite and helpful. I would come here again just for the location. In Gatwick's South Terminal, this unique Japanese-style capsule hotel offers free Wi-Fi and a 24-hour front desk. Yotel Gatwick Airport is a 15-minute walk from Gatwick North Terminal. 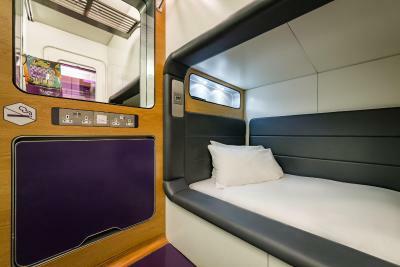 The compact cabin rooms each have a jukebox music system, relaxing mood lighting and a workstation. All rooms have a flat-screen TV and luxury bedding, and the bathrooms feature monsoon showers and bespoke toiletries. 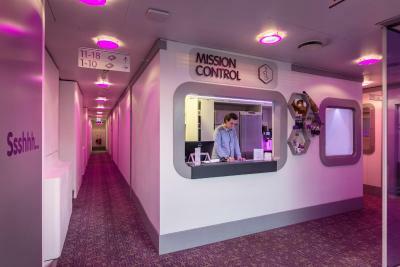 The ultra-modern Yotel Gatwick Airport offers unlimited free tea and coffee from The Galley and a 24-hour cabin service menu, including light meals, snacks and beverages. The hotel is located within the South Terminal building, just steps from the shops and cafes. This property also has one of the best-rated locations in Horley! Guests are happier about it compared to other properties in the area. YOTELAIR London Gatwick Airport has been welcoming Booking.com guests since 9 Oct 2008. When would you like to stay at YOTELAIR London Gatwick Airport? Each of these cabins has a 1-metre-wide handmade bed, ideal for one person. Each cabin has a handmade double bed that converts into a couch at the touch of a button. The premium cabin is suitable for 2 people or someone requiring additional space. House rules YOTELAIR London Gatwick Airport takes special requests - add in the next step! YOTELAIR London Gatwick Airport accepts these cards and reserves the right to temporarily hold an amount prior to arrival. Yotel is located in the public area (not the secure transit area) of the International Arrivals section in the South Terminal of London Gatwick Airport. Guests starting their journey from London Gatwick Airport do not need to go through UK customs or be checked-in with the airline. All transit passengers must have valid entry to the UK and must pass through immigrations in order to access the hotel. Please note that extra beds are not available at the property and there is no capacity for cots in the room. Great location. Great end of bed TV. Good shower/wash area. Pull out table. For only £10 cheaper than the Hilton, the Hilton provides a more comfortable stay. But if 'lowest price' is key at any level, it's a great little stay. Cosy and did exactly what was required - provided close, airport location for a 01:00 arrival without needing to travel to London prior to the trains starting up again. Not great having to go to reception for coffee/tea hairdryer etc once you are in your pyjamas. Stayed before but it's now looking a little tired and scruffy in places. Excellent location but surprisingly quiet with it. The electric plugs are UK only, to plug your PC charger in you need a adapter. It is a cool experience if you didn't do it before. Space is tight but well thought through so you have all you need. Bed is very comfortable and you don't feel trapped inside even thou there are no windows. Being at the terminal is great. you don't have to worry about being late for your flight due to traffic.